This "Historically Speaking" column appeared in the Exeter News-Letter on Tuesday, August 6, 2013. To get a better picture of everyday life, historians look to diaries and memoirs. There are several types of diarists – those who record events: ‘went to grocery store. Weather fair. Spoke with Mrs. Watson’ – and those who record thoughts. Hannah Brown of Exeter mostly recorded her thoughts. October 24, 1857; “Since I took my pen, there has nothing new happened worth writing you.” Thanks for that, Miss Brown. A memoirist, however, writes with a purpose. Usually, he or she wants to talk about what their life was like and the mundane ‘dinner at 6:00 – chicken, potatoes, corn’ turns into a commentary on what the food was like. One Exeter memoirist, Elizabeth Dow Smith Leonard, wrote her thoughts in 1878 remembering what life was like when she was a girl. Sure, she’s offering us an adult’s version of what her childhood was like, but this provides us with the reflection necessary to understand how much things have changed and that was her goal. Elizabeth Dow Leonard was born in Exeter in 1806 to comfortable conditions. Her family lived on Front Street in one of the finer houses until she reached about the age of 10. Then, like so many families, they experienced some financial downturns that forced the family to sell most of their real estate and settle into an older house on Water Street. There is an edited version of her memoir, “A Few Reminiscences of My Exeter Life” that was published in 1972, which leaves out some of her early life, but the original manuscript resides at the Exeter Historical Society. Nearly thirty when she married Samuel Smith, a consumptive man who died a few years after their union, Leonard must have wondered about the silliness of romance. Her second husband, the Reverend Levi Leonard, was a Unitarian minister from Dublin, NH. The couple seems to have split their time between the two towns and Levi was, for a time, in charge of the editorial content of the Exeter News-Letter. Elizabeth was able to express herself during this time as the News-Letter noted after her death, “she was an extensive contributor to the literary department of the News-Letter at the time her husband was the editor.” But there must have been some grudging resentment that her entrance into the literary world was dependent on her association with her husband. No wonder she so often grumbled about limitations placed on women. Elizabeth Dow Leonard didn’t live long enough to see women gain the right to vote. She never knew that one day women would enter college at rates higher than men. She wouldn’t know Elena Kagan or Condoleeza Rice, but if her memoir is any indication, she would have applauded their ambition. 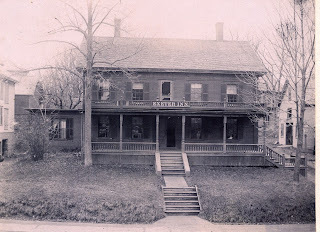 Photo: Childhood home of Elizabeth Dow Leonard taken around 1895. 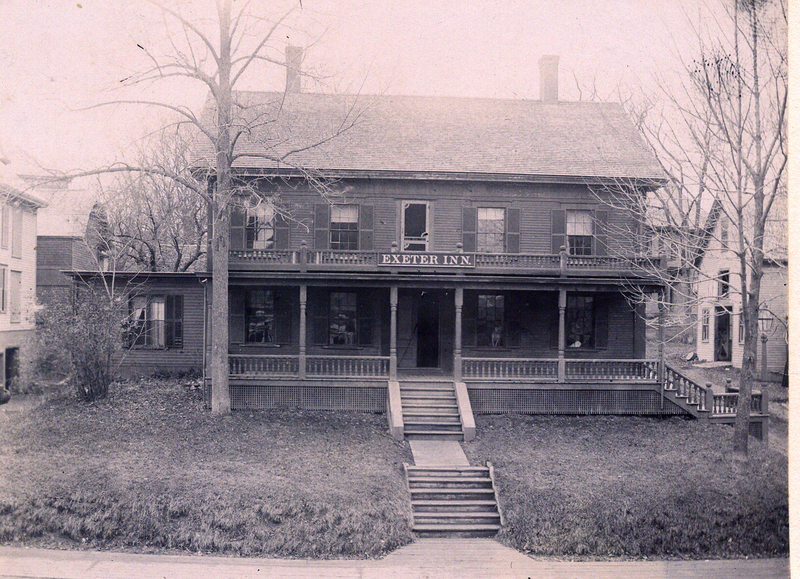 The house stood on Water Street where today the Squamscott Building stands. In 1895 it was called the Exeter Inn. It was razed in 1958.